Use computerized diagnostics to identify issues. Perform typical routine maintenance such as rotating tires, changing the oil, and checking fluid levels of the vehicle. Put the vehicle through tests to make sure everything is working up to par. Use a checklist to ensure you didn’t miss anything crucial. Repair or replace broken or worn vehicle parts. Discuss what type of repairs are needed with your customer and further explain anything once you are done. Follow manufacturer or customer requests on repairs. Increase your hiring potential by having some postsecondary education and training. Trade school programs last around six months. You’ll receive a certificate of completion at the end. At a community college, you’ll receive an associate degree. Programs last two years if you’re enrolled full time. If you graduate from a program, then you’ll need minimal amounts of hands-on training. 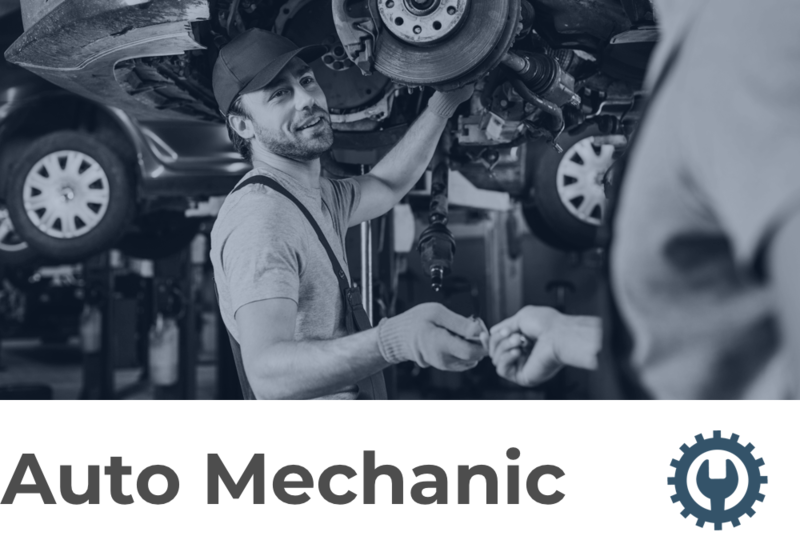 Get tricks of the trade by getting trained by a more experienced mechanic. You may need a license from the EPA if you’re working with refrigerants. Or, if you complete certification tests A1-A8, then you are recognized as an ASE-Certified Master Automobile Technician. As an auto mechanic, you will earn a median salary of $38K, with the top ten percent of your colleagues earning $64K. If you’re working at a dealership or for the manufacturer, then you might have a “flat rate” or “flag hour” structure where you get paid based on the work you’ve completed—the more you finish that day, the more you get paid. Some shops will pay hourly as opposed to this: You will always make the same amount per hours worked. Either way, you’ll be familiar with overtime. And most likely, you’ll be working weekends and evenings, as well. Auto mechanic job growth is remaining steady at 6 percent, with close to 46,000 available positions opening through 2026. Finding a job should be fairly straight forward if you’re certified and qualified. As the technology behind cars evolves, they become more reliable. This means that in the near future, you’ll really only be performing routine maintenance as the bulk of your job.